I was perusing the interwebs, trying to find more of my antique apothecary jars (photo above - I have 3 of these that I scored at an antique vendor and I want more!) 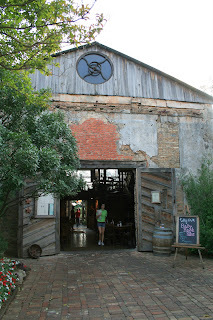 and I came across the Barn House Marketplace. If you love little vintage treasures as much as I do you've got to check out this online boutique! This isn't your average antique flea market, they have some seriously beautiful things. They definitely have an eye for the curious collectible. And, if the merchandise they are pedaling isn't enough, just check out the photography of said merchandise...that alone kept me on their site for almost an hour! Love these!...and the striped bows, perfection! I will take one of these sweet little aprons, absolutely! I wanted to copy every photo from the site, it was really hard to choose. I want one of each of these jars! 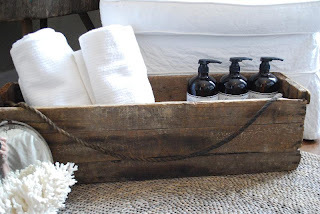 The simple beauty of these pieces makes me want a simpler life in a charming little farmhouse full of these little treasures. 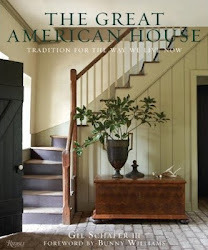 You can follow the Barn House Boys on their blog here as well. When I first heard the news of your deteriorating health I found myself devastated and feeling helpless, and it made me think that I really wanted to be sure that you knew exactly how I felt about you and that you knew how truly loved you were. When you became a part of our lives, almost twenty years ago, you filled a place in my heart that desperately needed filling. You sacrificed and loved my sisters and I like we were your own children and I am so grateful for your love. 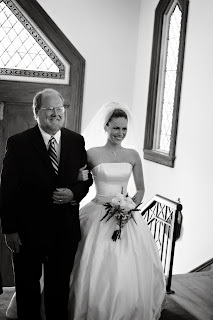 You were a wonderful role model of a Christian, a father, a husband, a friend and a very revered doctor. I can hardly find the words now to express my gratitude for all that you have done in mine, my mom's and my sister's lives. God brought you to our family as a father and a friend. Looking back, I have so many great memories of you: taking painting classes together, taking me to see model train layouts (which you loved), taking my girlfriends and I to get doughnuts the mornings after sleepovers, teaching me to drive and later laughing about me almost driving head-on into a brick mailbox and then surprising me with my first car when I turned sixteen, my high school graduation, always being there as I grew from a girl into a young woman, getting me ready to go out to Texas Tech, coming out to Lubbock to present me to my sorority and then moving me home after my college graduation, supporting me as I found my way into the "working world" and then standing next to me on my wedding day and proudly giving me away to Frank. There are so many memories and for all the ones that I listed there are so many in between. I can't fathom what my life would have been like without you there. The bible says Jesus said "I am the resurrection and the life. He who believes in me will live, even though he dies; and whoever lives and believes in me will never die." John 11:25-26 and "For God so loved the world that he gave his one and only son, so that whoever believes in Him shall not perish but have eternal life." John 3:16 As believers, we know that we are here to serve the Lord and by loving my mother and us girls, amongst many other things, you served the Lord well. Near the end it broke my heart to see you struggle in your earthly body. ALS held your mind captive in a body that was dying. "He will wipe every tear from their eyes. There will be no more death or mourning or crying or pain, for the old order of things has passed away." Revelation 21:4... You are free now! With Jesus' spirit in our hearts we know that we are only here, on earth, for a very short time as we wait to be taken home. We, as believers, have eternal life! I cherish the time that the Lord gave us together. I miss you. God has been so good to us. He has carried us through a challenging time in our lives and has blessed us in so many ways! We have a home now, a place to call ours, and I can already feel our roots reaching deep into the ground. The sun is shining again. I've had some requests for photos and I will gladly share when we get fully unpacked. Above is a glimpse of my new kitchen that I am positively in love with!!! It's Wednesday and we are moving into our new home this week, yay. I'm a little sidetracked and don't have a whole lot on the blog roll, so here is a little mid-week hypnosis for you. 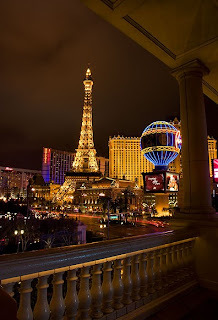 I hope that you enjoyed my top three Vegas picks from our most recent trip and might even be inspired to try one the next time you're out there. After spending a little too much time in that glitzy city it was so nice to have a weekend in the hill country and get back to our roots. Our dear friends came down from Dallas and we spent our time together driving through the hill country and enjoying some of the landmarks that make our state so great! 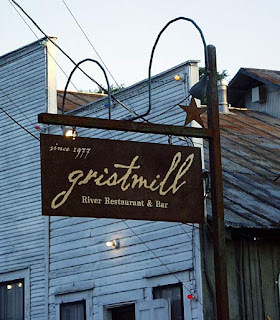 On Friday, we met up with everyone at the famous Gristmill overlooking the Guadalupe river. 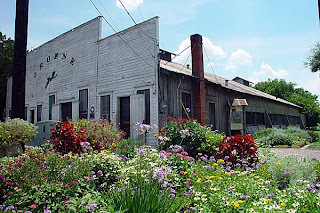 If you are ever in those parts you HAVE to stop at The Gristmill and have a chicken fried steak and a Shiner Bock. HAVE to. The only thing better than the food and atmosphere were our dear friends that we've missed so much since our move to San Antonio. On Saturday we drove to Wimberley and piddled around the local shops that this sweet little town is brimming with. We picked up some raspberry chipotle salsa, jalapeno mustard and Mildly Wild bbq sauce...all from local Texas vendors. We also bought a mason jar full of Praline Pecan Honey Butter...oh. my. word. This deliciousness on a biscuit will melt in your mouth!!! 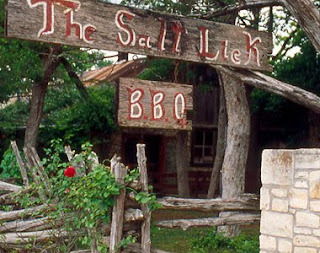 After an afternoon of shopping we drove out to Driftwood for some world famous (I don't know for sure if it is world famous, but it should be) Salt Lick Barbecue. It is a Texas landmark and is some of the best bbq you will ever taste!!! Just look at the pit! My recommendation is the sampler platter with sausage, brisket and ribs...yum! Enjoying a beautiful central Texas 60 degree day and licking our chops thinking about the amazing bbq we are about to gorge on. 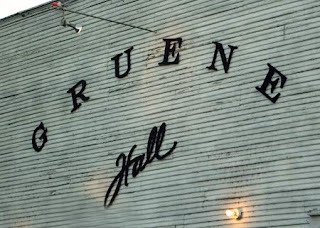 Next on list was to see Stoney LaRue at the legendary Gruene Hall. 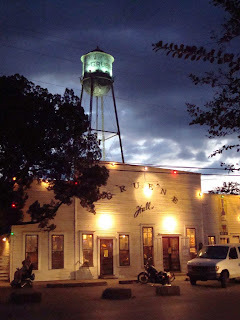 It was built in the 1880's and is the oldest dance hall in Texas. This place is full of true Texas charm and you can't help but feel all warm and fuzzy when you're drinking Lone Star, listening to some great music and hundred year old wood floors are creaking beneath your feet. This weekend was just what we needed to soothe our souls...great friends, great food and great music! I can't wait for everyone to come back down so we can do it all over again! 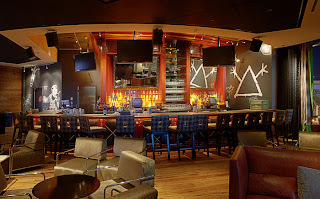 Another favorite hotspot is Mix at THEhotel, which is the boutiquey little sibling to Mandalay Bay. Mix isn't a new restaurant just a favorite. Can you see why?! The design is stunning! Contemporary isn't usually my thing, but when you are in Vegas it is fun to experience different styles and live in another world for a little while. 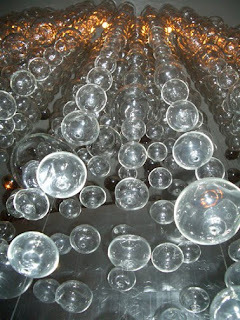 A glass elevator whisks you up to the 43rd floor and you step out into, what feels like, the inside of a champagne glass. While you dine below, a bubble light chandelier, made from 15,000 hand-blown Murano glass balls, suspends dramatically overhead and you can't help but feel like a Jetson! The all white color palette is fresh, clean and crisp and the furniture is sleek and stylish. You will feel cool in there, I promise! 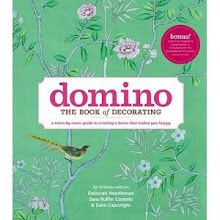 And if seeing the decor isn't enough, (I'm a designer, I was checking out the design...who cares about the food?!) the cuisine is French American influenced and was absolutely delicious!!! 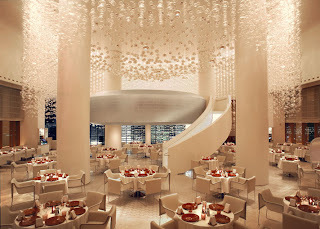 The dining experience is dramatic and chic and oh-so-Vegas! Be sure and arrive early so that you can have an aperitif at the swanky Mix Bar & Lounge, that also has a spectacular view of the strip. The view from the bar at mix. Mix is luxurious and unforgettable and I highly recommend it! 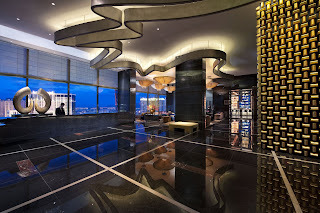 My next fave on the Vegas Diaries list is The Bar at the Mandarin Oriental Hotel. Can I just say WOW! 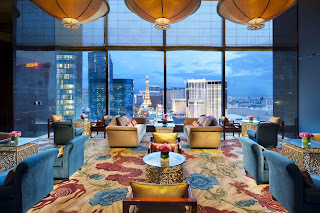 The Mandarin Oriental is one of the newest hotels on the strip and is part of the breathtaking CityCenter project, which is nestled into prime real estate between The Monte Carlo and The Bellagio. We've watched this massive complex go up over the past few years and were so excited to finally experience what it had to offer. Much of the steel construction on the CityCenter project is Beck Steel and made our visit that much more special. From the moment that you pull up at the front doors, it is a first rate experience. Your car door is opened by men in top hats and you are graciously greeted by a member of the hotel staff dressed in, none other than, a traditional mandarin collar shirt (perfect detail). 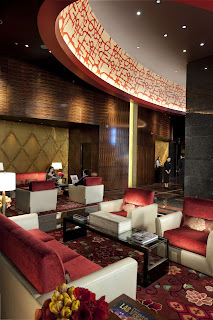 The gentleman ushers you to an elevator that whisks you up to the top, where you exit at the Sky Lounge. The first thing you see is an amazing installation of gold bricks that spans from the floor to ceiling. 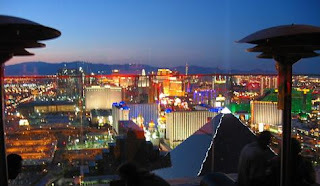 Once you step out of the elevator you can take in one of the most spectacular views of the strip. The first stunningly designed space you pass through is the Tea Lounge. 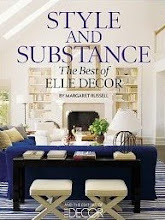 It is elegant, perfectly edited and represents the best of design with an Asian flair. We stopped here for a photo opp with the glittering Vegas strip in the background. From the Tea Lounge you enter the Mandarin Bar through two massive and ornately carved doors. 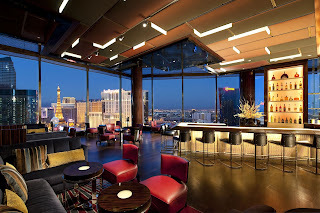 Floor to ceiling windows around the whole bar give you a 180 degree view of the strip. 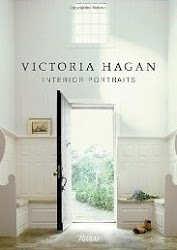 Finishes like macassar ebony, velvet, silk and rich leathers are all part of the visual, and tactile (if you're like me), experience. We scored a seat on a purple mohair banquette, filled with velvet down pillows and a prime view. The drink menu is as appetizing as the interiors. You can sip on a Lemongrass Mojito or their signature martini, The Golden Leaf, while nibbling on cinnamon cashews and lime and cilantro kalamata olives. The staff was delightful and extremely attentive, and the design was spectacular! I highly recommend The Bar at the Mandarin for a perfect Vegas experience. If you don't make it to the bar, at least take a stroll* around the CityCenter, it is truly something to see. *by stroll, I mean miles of walking because the property is unbelievably massive! 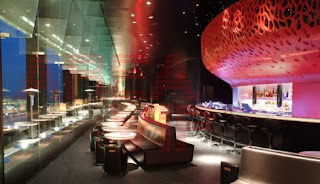 One of the new restaurants we tried was First Food & Bar at the gorgeous, and somewhat of a baby to the strip, Palazzo. This place is cool! It is very reminiscent of the stylings at the Ace Hotel that I blogged about here. It has that whole 'punk rock vibe from the 80's' feel and loads of fun energy. 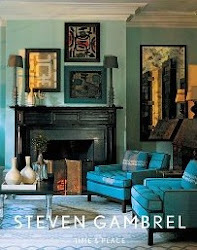 The industrial, urban design manages to be rocker-hip but not themey (which I hate). 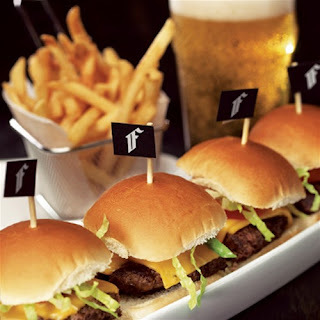 We grabbed a booth overlooking the strip and enjoyed these little yummies along with their popular bloody mary that has everything but the kitchen sink in it (think celery, olives, slim jims...). 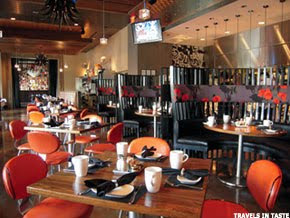 Much of the upholstery is leather and varies in many interesting colors, especially the orange leather chairs with black piping in the main dining area, which give them that unmistakable Harley Davidson look and automatically makes you feel a little edgy. The floors are stained concrete and look like tribal tattoos are embedded in them and great music pumps out of the speakers overhead. Many of the walls are adorned with graffiti and black leather with large, silver nailheads. The ceilings are planked in a beautiful warm wood but spiky, rusted steel chandeliers give the refined, smooth wood that "I'm rock n' roll" statement. It's the neighborhood biker bar with the vintage soul of a rocker but with just enough style to not feel kitschy. 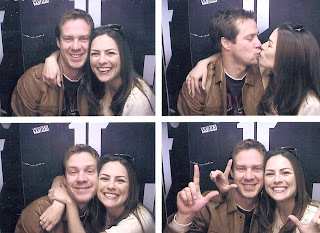 After you are fat and happy, plop down in the old-school, graffiti sticker covered photo booth on your way out for some fun memories. 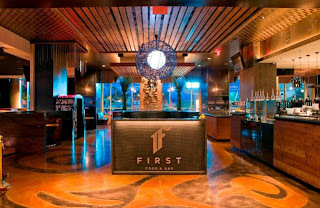 I give First Food & Bar two thumbs up! Hello chickees! I'm blogging from Las Vegas this week. My husband has a large convention that he exhibits his trucks in and so for a little over a week we live in Vegas every year. Needless to say, we are ready to get the heck out of Dodge when the show is over...the dinging will get to you after a while. But, on the other hand, it is hard to come to this town and not be inspired. 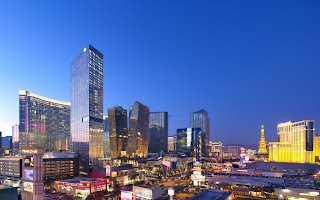 Vegas is so opulent and there is so much to do and see in this city. 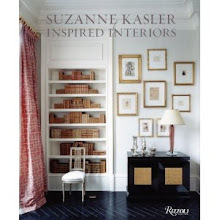 Every inch is on the brink of visual overload and so there is plenty to keep this designer's eye occupied. I have some posts cooking of some of the new delightfully designed restaurants and hotels that we've seen this go round, so I'll try to keep my act together this week and share with you guys. 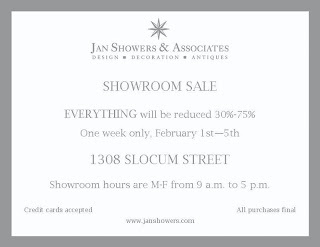 Many of you know that I have a huge design crush on the lovely Jan Showers and for those of you that live in the Dallas area, her elegant showroom is having a floor sample sale. If I were around those parts I would definitely be stopping by! Here are a few of the goodies that you could score for 30%-75% off!!! 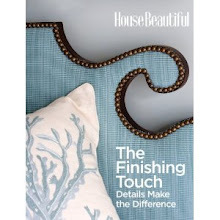 Many pieces would be a splurge but with prices marked down like this, it would be the perfect time to get a special designer piece for your home. I'm a little bit more than obsessed with this bar stool. 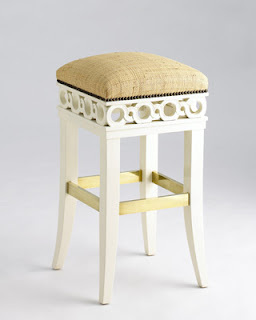 This is seriously beautiful, and it is just a bar stool! 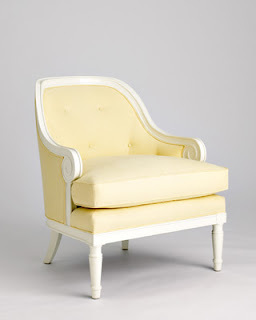 This sweet little seat would be yummy in my master bedroom! 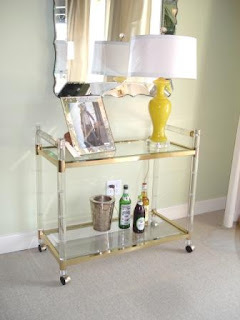 I've been wanting a drink cart forever! 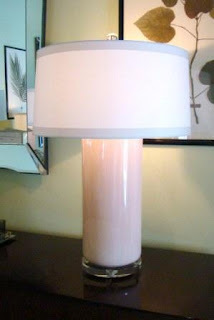 This one is so cool with lucite legs, love it! 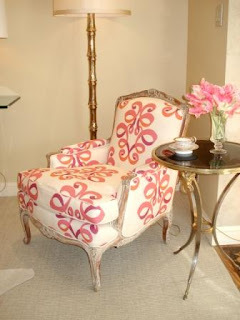 How cute is this chair?! 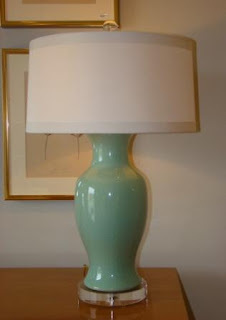 Mrs. Showers has a lovely collection of lamps that she manufactures at her factory in Murano. 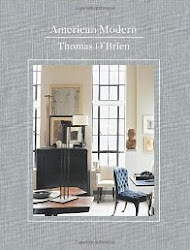 If you have a chance to check it out, I wouldn't miss this sale, even if you don't buy anything the showroom will inspire you! I'll be back later this week for some fun Vegas stuff.